Karen L Messick Photography: Inlet View Drive, Chincoteague, Va. Sometimes a place speaks to you, for no good reason other than you happen to be there. 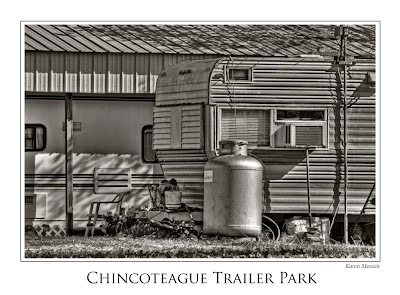 I have never really stood in a trailer park before much less one that has a magnificent view of the inlet on Chincoteague, but as soon as I parked and got out of the car two feet from the water's edge, I was feeling the lifestyle on that point. The sea was really shining from the mid day light and the fishing boats were going in and out of the harbor. Immediately I saw the place in black and white as the contrast of the light was harsh. 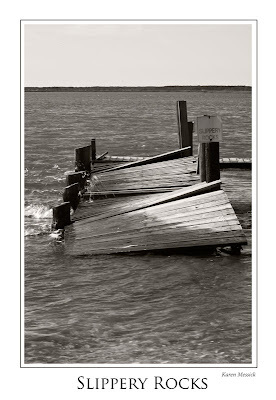 After making a few images of the boats back lit on the water, I made some of the falling down pier and a picnic table that still had a bowl sitting on it. 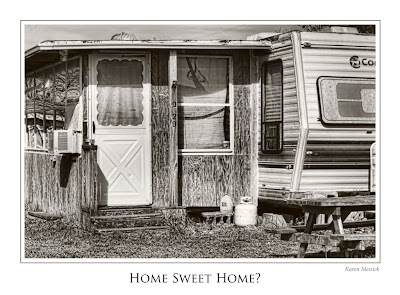 The trailers were humorous, with the left over items of daily life scattered about and the handy man additions. It was just a slice of life on Inlet View Drive. I imagined in season, how busy the point might be with fisherman and residents enjoying this water side spot. I saw some humor in the pier that cautioned about the slippery rocks! You have a creative eye Karen, I would not even have noticed the opportunities. I struggle with figuring out what makes a good black and white image. Thanks for your tips. Wonderful shots. Love the slippery rocks pier.